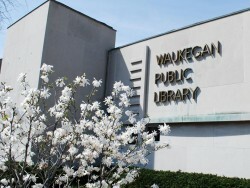 Saturday and Sunday: 1 p.m. – 5 p.m.
Monday – Thursday: 11 a.m. – 7 p.m.
Three hours of free parking are provided by the City of Waukegan in the City Garage located at the corner of County and Clayton Streets for all Library patrons. Please bring your parking ticket from the garage to be validated at the Customer Service Desk. Each additional hour in the garage is $1. Street parking is available at metered spots near the library. Meters are 25¢ for each half hour and are strictly enforced between 8 a.m. and 5 p.m. Parking fines are $20 per violation. For further information click here. There is free parking available in the Fieldhouse parking lot, where the Hinkston Park Branch is located. There are two dropboxes at the Main Library. They are located at the front and rear of the Library. There is also a dropbox in the parking lot at the Hinkston Park Fieldhouse. The Main Library is on County St. between Washington St. and Grand Ave. It is located on the southwest corner of County and Clayton Streets, just north of the County Building. Exit Washington Street East. Stay on Washington for about two miles. Turn left (north) on County St. 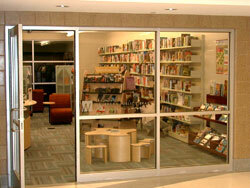 The library is located two blocks down on the corner of Clayton St.
Exit at Grand Ave (Rt 132), turn right. Stay on Grand for about two miles. Turn right (south) on County St. Go one block to Clayton St. The Hinkston Park Branch is located inside the Hinkston Park Fieldhouse at the corner of Baldwin Ave. and Grand Ave. east of Green Bay Rd. November 27, closed at 5 p.m.
December 23, closed at 5 p.m.
December 31, closed at 5 p.m.